Native plants are vital for bees, birds, butterflies and our local waters. Join us for a summer volunteer outing in the prairie or woodlands to protect them! Last year, FMR volunteers installed over 5,000 native prairie and woodland plants. These ecological powerhouses filter pollution, reduce erosion and provide much-needed bee, butterfly and bird habitat. Now we need help getting these young plants through the summer. Let me know if you can pitch in at one of these 2-hour June prairie and woodland events! We’ll take care of supplies and training, and I’ll send directions to the correct meeting spot and other basics. Capacity is limited. We make sure there’s just enough work so that everyone’s busy, but not so much that we can’t take the time to enjoy these special places we’re protecting. p.s. For more detailed descriptions, please see the FMR calendar. 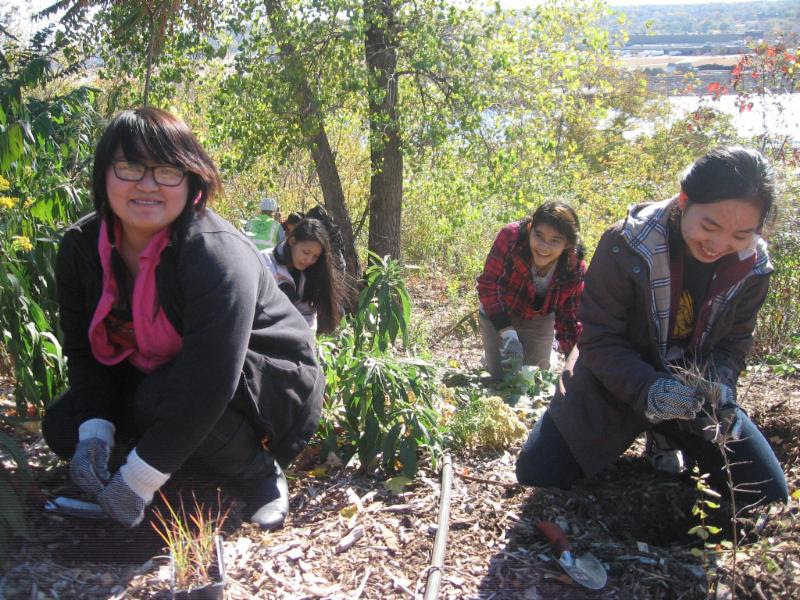 Help tend the newly planted raingarden and ‘green infrastructure’ at the confluence of the Mississippi and Minnesota Rivers in St. Paul. Volunteers have done a great job helping the native plants along the shores of Ravine Lake in Cottage Grove. But now this naturalized area needs a good burn, and there’s too much deadwood to safely send in the fire crew. Are you up for hauling a little deadwood? Join us in Minneapolis’ oldest park! Help tend the native grasses, flowers and small shrubs that offer much-needed urban wildlife habitat and reduce erosion in the Mississippi River Gorge. Join us at St. Paul’s iconic bluff-top park! The native prairie plants are coming along nicely; they just need us to take out some burdock and other invasive species trying to crowd them out. This Scientific & Natural Area just south of Hastings is home to 14 rare plant and animal species. Volunteers are needed to remove invasives, such as cow vetch and spotted knapweed, encroaching upon the tallgrass prairie. Questions about one of the above events? Contact Amy, akilgore@fmr.orgQuestions about volunteering, or FMR outreach in general?